A fundamental building block Charles Darwin used in conceptualizing his theory of natural selection was selective breeding, and he specifically cited the pioneering work of Robert Bakewell in this field. Darwin noted that many domesticated animals and plants were developed by intentionally breeding individuals with special prized traits. Selective breeding, a term coined by Darwin, was practiced by the Romans 2,000 years ago and was described by the Persian polymath Abu Rayhan Biruni during the eleventh century. However, it was Bakewell, a leading figure during the British Agricultural Revolution, who introduced it on a scientific basis. Bakewell was born into a family of English tenant farmers and spent his early years traveling on the Continent, learning farming methods. Upon his father’s death in 1760, he took control of the farm and transformed its grasslands for cattle grazing by using his innovative breeding techniques, irrigation, flooding, and fertilizing pasturelands. He then turned his attention to livestock and, through selective breeding, produced the New Leichester sheep lineage. Characterized as large and fine boned, this breed’s long lustrous wool was extensively exported to North America and Australia. Today, Bakewell’s legacy is not his breeds but his breeding methods. Desirable traits are specific to the species being bred, and individual members are crossbred to obtain a hybridized product with these characteristics. Plants are commonly bred for high crop yields, a fast growth rate, and resistance to disease and negative climatic conditions. For chickens, breeding objectives might include the quality and size of the eggs, the meat, and the production of young birds likely to successfully reproduce. Aquaculture, involving fish and shellfish, has yet to achieve its full potential. Breeding objectives include an increase in growth and survival rates, meat quality, and resistance to disease, and for shellfish, also shell size and color. SEE ALSO: Wheat: The Staff of Life (c. 11,000 BCE), Agriculture (c. 10,000 BCE), Domestication of Animals (c. 10,000 BCE), Rice Cultivation (c. 7000 BCE), Darwin’s Theory of Natural Selection (1859), Mendelian Inheritance (1866), Genetically Modified Crops (1982). 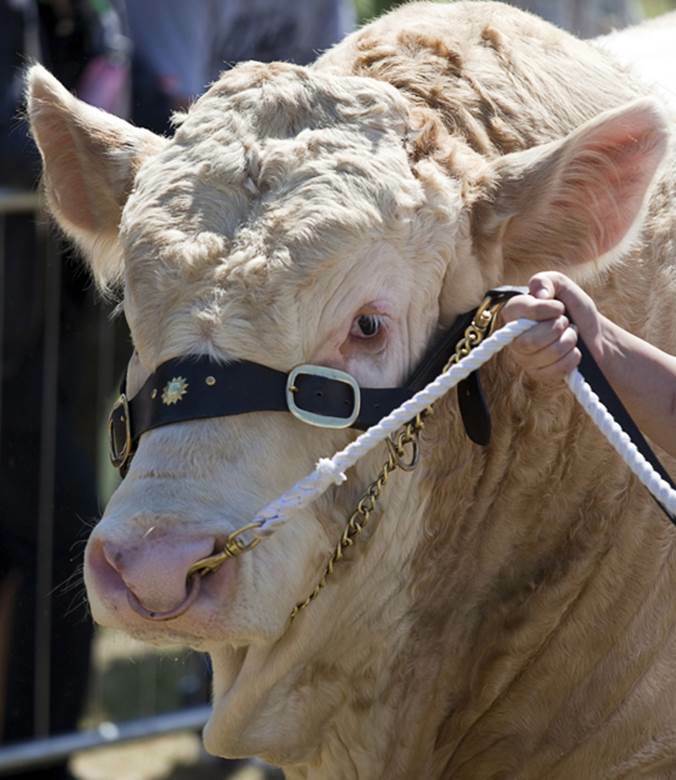 A champion bull is being led in the ring at an agricultural show in Scotland, perhaps anticipating another blue ribbon to add to his collection.